Loaded to the hilt! 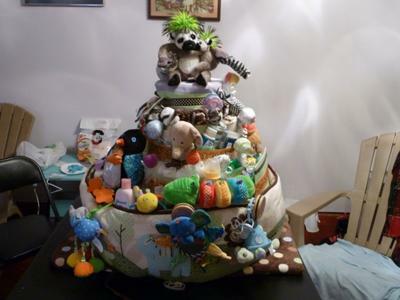 This cute diaper cake is filled to the brim with all sorts of baby essentials and toys! What a fun gift for a baby shower! It is the first diaper cake I have seen that used crib bedding in the 'recipe'. Great idea! Eve made this impressive diaper cake with her daughters. She went to the additional effort to share her photo and diaper cake description in order to be of help to others who are looking for some diaper cake ideas. We are so glad to add her diaper cake to our fabulous, reader-inspired diaper cake gallery. Thanks so much for sharing Eve! If you would like to add your own flair to our diaper cake gallery, click here to submit your own diaper cake photos and description. My Daughters and I made this Cake. We used a Crib Bedding Set for the base of the cake. I can't give a exact count on all the Diapers we used, but it was well over a 100 size 1 and 2. The rest was filled with outfits, blankets, socks, bibs, bottles, toy's. You get the point. This was made for my Great Nephew. I can't tell you about all the comments about it at the shower. Ours wasn't the only diaper cake there.. But my niece did say she had such fun uncovering all the goodies I hid inside.